Microsoft Hohm is an online web application that enables consumers to analyze their energy usage and provides energy saving recommendations tailored to their home. 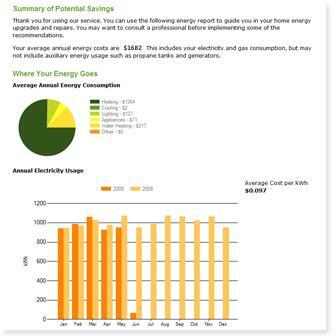 In short, if you’re looking to save energy and money, Microsoft Holm is a portal for you to start with. Microsoft Hohm has been launched earlier as private beta, but now everybody (from US) can register for free. Microsoft Hohm service is still been limited to residents in USA only as postal code is required during sign up. After signed up, user completes detailed information on home profile, such as year the house was built, floor area, heating system, when water heater was installed, and other questions about doors and windows, appliances, lighting, pumps, pools and other categories. Of course, user can always leave answers blank or select “Don’t Know” as the answer. All information about home will be linked to energy providers in the region for energy costs comparison. And based on the home profile, user can view energy report and recommendations or suggested ways on improvements that can be made to the home in order to reduce energy consumption, and energy bill. User can view these recommendations list by name, cost or annual savings filters. Microsoft Hohm also has a community that allows user to share your energy-saving ideas and experiences. Register and sign up for Microsoft Hohm for free at https://www.microsoft-hohm.com/SignUp.aspx. Windows Live ID is required.